First published in 1887, Gooch's Face to Face with the Mexicans, is on-line here in a very readable format. It includes the many charming illustrations by Isabel V. Waldo, as well as portraits of the characters in my novel, Agustin de Iturbide y Green and his mother, Dona Alicia Green de Iturbide. Note: an edited (severely abridged) version with an introduction by C.H. Gardiner was published by Southern Illinois University Press in 1966. However, said version does not include the material about the Iturbides. Princess Eulalia of Spain's memoir, which raised a kerfluffle of an international scandal back at the beginning of the 20th century, is on-line here, and in a very conveniently readable version. (I'm blogging about some of these royalty books as I beef up the links for the bibliograhy of my novel.) More anon. Yesterday I received a most extraordinary letter from a book collector and Maximilian expert who had in his possession a copy of Henry Ridgley Evans's Old Georgetown on the Potomac, inscribed by the author to one of the people who appears in my novel's epilogue (to respect his privacy, I won't say more than that). A note about Henry Ridgely Evans: the author of some two dozen books on freemasonry and magic (including a fine biography of Cagliostro), he lived in Georgetown, Washington DC and, as a child, played with the likes of the children of the Czar's ambassador Baron de Bodisco (whose house is now owned by Senator and Mrs Kerry), ex-Prince Agustin de Iturbide y Green (subject of my novel) and the daughter of the Japanese ambassador. It is a treasure of a book, full of charming details, and showing us a Washington that, for those of us who live there today, is almost impossible to imagine. The Georgetown Library's Peabody Room has a copy, as well as copies of several other of Evans's works. P.S. View the painting with the same title here. The large building with two spires is Georgetown University's Healy Hall. Note also the Frances Scott Key House at the end of the bridge (since torn down). Please join me this Wednesday for a free preview of the Writers Telesummit. I’ll be sharing some useful practice tips for writers (and for all creative people) and explaining the benefits, some of them quite surprising, of attending our virtual writers’ conference. There’s also a very nice free gift if you join in on the free phone call. I hope you’ll drop on by. Always On by Naomi Baron is one of the most original and profound works on the changes wrought by our modern communication technologies. As for me, two and half years into blogging, I'm still fascinated by the form and though I've anounced (see sidebar) that I update on Mondays and Wednesdays, I generally blog almost daily. But I loathe cell phones, watch a gnat's portion of television, and am still not ready for facebook. As for LinkedIn, I have my doubts. Once in a while I accept an invitation to link, but it gets weird. The other day I tried to invite a fellow novelist to link, but LinkedIn refused to recognize my password--- which brought on multi-layered meditations on the bungle-fangled capitalist appropriation of social networks. Yesterday, on the advice of a fellow writer, I joined Goodreads.com, thinking it would be interesting to explore and perhaps help gain some visibility for my books. But why (when that's my publisher's job)? Or, why not (when it might be both fun and useful)? The eternal conundrum: what to do, what not to do? "most of us have more freedom than we realize to shape our own usage of language technologies. We have substantial say over the extent to which we multitask." 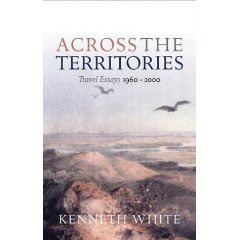 New on my list of recommended travel memoirs: Kenneth White's Across the Territories: Travels from Orkney to Rangiroa. White is a Scottish poet and founder of the Institute for Geopoetics. Read more about the Scottish Centre for Geopoetics and about White and his work here. More anon. Solveig Eggerz, Richard Goodman, Leslie Pietrzyk, Isabella Tree, David Taylor, Sandra Beasly, Jane Kinney Meyers, Nani Power, Dan Olivas, David Lida, Kim Roberts, and many more...check out the new archive of Madam Mayo guest-blog posts. More anon. Doing some housekeeping here, as the sidebar gets increasingly cluttered. You'll notice that the link to the blogroll is new. Also new: American Fiction , Kinemapoetics, MeowBarkBlog, and several new Mexico-related blogs, including Border Reporter and Intersections. More anon. Why isn’t more French writing being translated? Why isn't more Mexican writing being translated? There are some dozen books in the Whereabouts Press Traveler's Literary Companion Series, including Italy, Greece, Vietnam, Israel, Australia, Ireland, Japan, China... and more in the pipeline. Visit my page for Mexico: A Traveler's Literary Companion here. The cartoon by Yirmumah. Commissioned for USD $2 by Yours Truly. For no particular reason. Are now on-line via the Maximilian page. 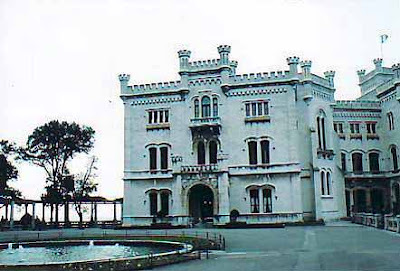 News about the novel, The Last Prince of the Mexican Empire? The publisher is Unbridled Books. The revised mansucript awaits copyediting and the cover is being designed... More anon. A poet's take. Casual. Eclectic. Newsy, friendly, thoughtful blog by an accomplished and hard-working literary novelist. Nobody covers the world's wackiest megalopolis as originally as David Lida. The uber-cool renaissance font guy. 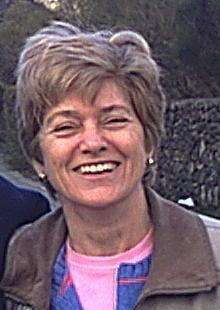 And here's a writer I wish would blog: Hattie Ellis. Now taking applications for the October 18th one day "Techniques of Fiction" workshop via Dancing Chiva. The first ever "virtual writers conference" is coming up. Click here for the full line-up. I'm doing the travel writing workshop on Thursday September 4th. I believe she lived on Connecticut Avenue. I know she was in Washington for a time and had many Washington connections. This high-ranking Freemason and all-around very curious person lived on I Street NW. I have the address somewhere... I came across Evans's works when I was researching Georgetown history for my novel, The Last Prince of the Mexican Empire. There is an ample collection of his books in the Georgetown Public Library's Peabody Room. News from Tameme Chapbooks ~ Cuadernos --- all over the Mexico City press! The latest wonky widget thingamajig on Madam Mayo is the Feedjit (see sidebar). It's kind of Orwellianly freaky. I may remove it. I may not. Hmmm. My novel, The Last Prince of the Mexican Empire, has been revised for maybe the 718th time. But this is it--- it goes into copyediting now. Just sent it to the publisher, Unbridled Books. Pub date still to be announced. Maybe spring 09? I will be touring for the book in the US, especially Washington DC, New York City, the west coast, and also a bit in Mexico (especially Mexico City, San Miguel de Allende, and around Los Cabos). Click here to sign up for the mailing list. More anon. The proliferation of online tools, social networking sites, and Web markets has created a lot of opportunities – and revenue streams – for writers. But along with the possibilities may come some confusion. Do you need a website? What is Twitter? What’s the difference between a blog and a vlog? Why do writers need Facebook? In this all-day seminar, we’ll walk you through some of the most popular and writer-friendly Web tools to help you find new work, promote your services, sell your book, and build your platform. Member cost is $89, Non-members cost is $129, and Students cost is $49. To RSVP, call (202) 775-5150, send an e-mail to rsvp@washwriter.org, or register online at www.washwriter.org. Please mention the event for which you are responding and your membership status. P.S. Last winter I chaired the panel on blogging for their winter fiction seminar and also did a workshop on same for the Maryland Writers Association. Here's the handout (with links): "Writers Blogs: Best (& Worst) Practices". More anon. Book presentations and readings--- read all about it here. More anon. While I wind down pre-judging the Flannery O'Connor Award (must write comments on the selected seven for series editor Nancy Zafris), travel writer and writing teacher Richard Goodman guest-blogs again! His latest book is The Soul of Creative Writing. He is also the author of French Dirt: The Story of a Garden in the South of France, one of the founding members of the New York Writers Workshop, and teaches creative nonfiction at Spalding University's Brief Residency MFA in Writing Program in Louisville, Kentucky. Over to you, Richard! My Favorite Five Books With the Word "Soul" in the Title. Yes, I know five. And they are all very good books it turns out. While this may seem a bit gimmicky, it actually reveals something about the intensity and depth of the word "soul." I chose it as part of my own title with a great deal of respect and some trepidation. It's an august word, and meaningful, and, to be truthful, I still have my doubts as to whether or not I've used it in vain. But it was too appealing to resist. The five books are all very different, but what connects them, I think, is an attempt to get at something intangible, essential, elusive, unique and powerful. I left out some well known "soul" books (Dead Souls comes to mind), but five's the limit. Soul On Ice by Eldridge Cleaver. For those readers who have never heard of the Black Panthers, and for those who have simply relegated them to a dusty corner of their memory, this book, published in 1968, will be a stern enlightenment. Cleaver was one of the founders of the Black Panther party. He spent time in prison. Eventually, he fled to Algeria to avoid criminal prosecution. This is a brutal, hard book, with a bitter taste, but he pulls no punches. Care of the Soul: A Guide for Cultivating Depth and Sacredness in Everyday Life by Thomas Moore. This book was given to me by the great editor Hugh Van Dusen. Hugh, who has worked at Harper Collins for years, and edited some of the world's most famous authors, is a wonderfully urbane, elegant and generous man. When he gave me this book some years ago, I was skeptical. The title seemed a but new-agey for me. I was wrong. It's a powerful book, and one of the most important things it does is to make a distinction between the heart and the soul. The Soul of a New Machine by Tracy Kidder. This book, told at a breakneck pace about a breakneck race to build a new kind of computer, is a brilliant look at the huge pressures involved in trying to stay one step ahead in cyber technology. What makes this book especially wonderful is its sense of irony, and ultimately, of disappointment. Dark Night of the Soul by St. John of the Cross. This sixteenth century Spanish monk, and friend of St. Teresa, wrote stirring poems about the soul's effort to unite with God. Whether you're a believer or not, it's hard to resist verses like: When the breeze blew from the turret / as I parted his hair / it wounded my neck / with its gentle hand / suspending all my senses. The Souls of Black Folk by W. E. B. Du Bois. This seminal book begins, "The problem of the twentieth century is the problem of the color line." Now, as we move steadily into the twenty-first century, has anything really changed? This book, by the "Bard of Great Barrington" and one of the most influential black thinkers who ever lived, is a favorite. ---> For the archive of Madam Mayo's guest-blog posts, click here. 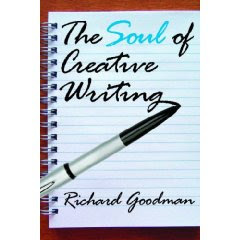 Back blogging next Wednesday with another fun guest-blog post from travel writer and writing teacher extraordinaire, Richard Goodman (read his first guest-blog post here). I'm still plowing down the ohmygod pile of manuscripts for the Flannery O'Connor Award.